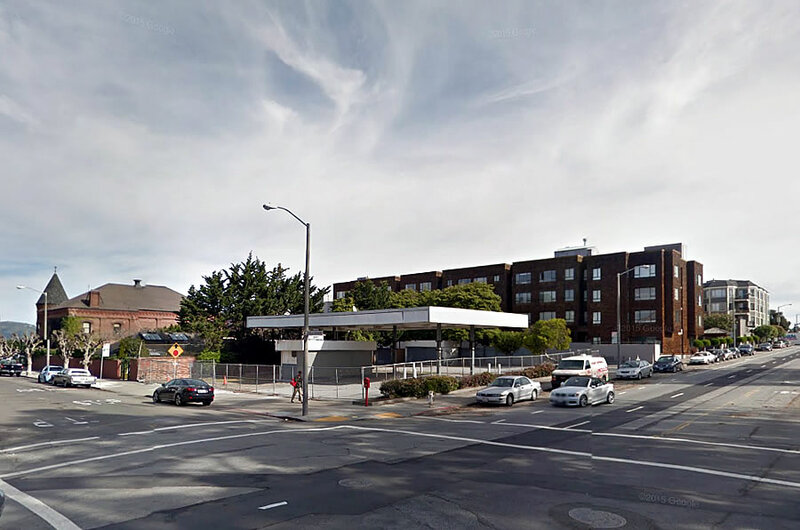 The plans for a four-story Marina building, with 28 market-rate condos to rise upon the shuttered Chevron station site at the corner of Bay and Buchanan, are slated to be Conditionally Approved for development by San Francisco’s Planning Commission this afternoon. And as we first reported earlier this year, “given the neighborhood sensitivity to overflow parking,” the designs for the brick-clad 1598 Bay Street development, which aren’t being challenged by the City, include an underground garage for 42 cars and a storage room for 40 bikes. The former Currie’s Chevron Station site, which has been shuttered since 2009, has already been cleared of its underground storage tanks and the paperwork for the project’s building permits has already been filed. And rather than include three (3) below-market-rate units on-site, Presidio Development Partners is planning to pay a fee into the City’s Affordable Housing Fund. That area needs some new density and rental units, don’t let the pay-in dictate, let the needs dictate. The possible extension of the F-Line and Central Subway means more density in this area, not less, and we should not let any organization buy the proverbial “get-out-of-jail-free-card” every time we build new units. Agreed. Affordable housing needs to be distributed to this side of town also. As long as Avalos and Campos are welcoming it in their districts, don’t expect any to be built in other districts. Neither Avalos nor Campos are welcoming these monstrosities to District 9…what are you talking about? Or did you miss the whole Prop. I thing on last month’s ballot? Campos endorsed Vida, I believe. Apparently it wasn’t obvious from the context, but I was talking about affordable housing, not market rate, just like the post I was responding to. 42 cars for 28 units? What BS. Anywhere else in SF it’s way less than a 1 to 1 ratio cars to units. Why should the Marina be different? Ehh… lots of SF has a 1 to 1 *minimum* ratio of parking spaces to units. 1 to 1 is the rule since the 1950’s I think, right? Do any buildings not have this requirement? There are parts of the city with lower requirements, and even maximums as low as one per four units. Because rich people don’t like following the same rules that they dictate to everyone else. Would you care to explain how the “rich people” managed to influence the developers proposal here? By assuring the units are marketable? That’s not really an answer. Cfb seems to feel the “rich people” haven’t followed the same rules as everyone else. I’m just asking him to clarify what he means. Who are these people? Exactly what have they done to affect the parking ratios for this project? So, if by some miraculous bit of serendipity, all those parking places don’t get used, what’s the big deal? There’s more research showing that if you pretend that an affluent household only has one car (and, for that matter, one bicycle), you’re creating a parking nightmare in the neighborhood. And a parking nightmare causes people to drive less, to avoid the hassle of searching for parking. Doesn’t look too bad. Would be even better if they tried to take some styling cues from the SF Gaslight Co. building on the corner. Guess the brick cladding will be that cue. Great, looks good, build that baby! Not really. Chicken and chicken. Public transit there is terrible. MUNI doesn’t care if you have a car, it’s awful no matter what. Great design, scale and height. Love the parking; about time we had a decent ratio that will be much used and appreciated. We need more of that. I assume your online nym is ironic then. Praise for such an obviously safe, conservative, and generic design? That explains a lot. What we need is your website so we can critique your own “designs.” Of course, if you really were an architect, you would have a website. I’m a jet plane mechanic and a professional surfer. I like it. Agree the brick is a nice nod to the SF Gaslight building. Hoping it isn’t an issue as it is either in or right next to a liquefaction zone. As for the parking, not sure how this is an issue. Perhaps some of the units will be offered two spaces as an amenity. Face it, these are condos being built in an area with people who have the means to buy them at market value, which will be high. 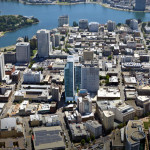 Having a second space could be a real amenity that most other condos can’t offer and therefore allow for higher prices. And regarding the height, this area has strictly enforced height limits and they are likely building up to the max allowed. Not to worry about the liquefaction angle, as I’m sure the brick is only exterior cladding and not structural. Yes, exactly. Most likely the brick is part of a panelized system, either GFRC or precast concrete panels attached to a steel frame. The brick is a nice, compatible material giving some respect to the adjacent Gas building; plus I think the dark/black window fenestration adds a factory sash/industrial component to the façade. Overall, solid, clean, modernist addition to the area. That’s a bingo. Fake brick veneer. Actually no. It’s not “fake” brick but real brick attached to a panelized system. And what kind of construction terminology is “that’s a bingo”? Futurist, you’re confusing the building unit (a “brick”) with the material it is made of (clay in this case) again. Not all bricks are made of clay. Not everything made of clay (like this fake brick veneer) is a brick. Col. Hans Landa: Bingo! How fun! But, I digress. Where were we? Well ok, but would be better if you stick to what you know. Are all the parking spot private or are some of them available to the public? I’m a bit confused by what you mean by “overflow parking”. If what you mean by the “we should not let any organization buy the proverbial “get-out-of-jail-free-card” every time we build new unit” is the fact that they are feeing out on the BMR units, this is what the City and the non-profit housing developers want. Until the housing bond that was passed in November, these inclusionary fees were the major source of funding for the 100% affordable projects the non-profits and the City develop. More curious than anything but what are the environmental and health issues related to living on a site like this? None? I think they have something similarly planned (only taller) for the gas station at the corner of Harrison and 1st street. 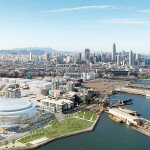 I just came across this rendering by RG Architecture. Any chance this is the more current design? Definitely a bit more curb appeal. No. The design is as reported and rendered above. What this article misses is that Seidel represents a change of architects with a radically different design from that originally proposed. 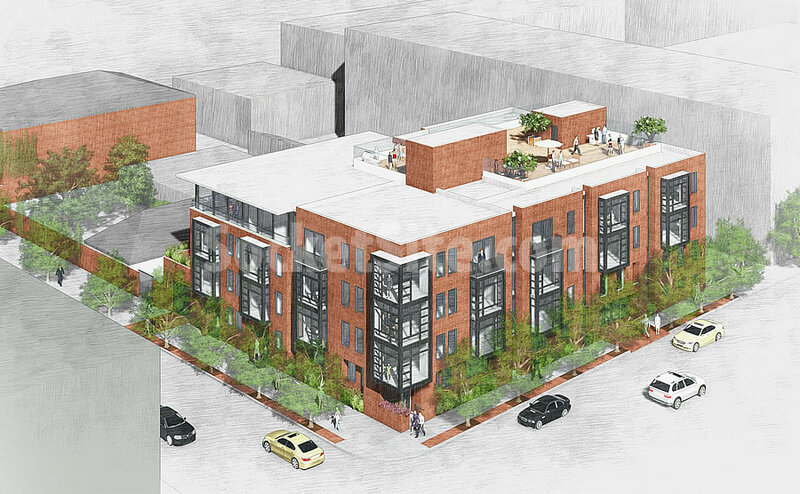 Earlier, RG Architecture had been engaged and submitted a much more “modern” conception for 1598 Bay . My hood, drive by that corner every day. The vacant gas station is an eyesore and it’s time for it to go. It was great to get gas there back in the day, but those days are gone. Build it. It’s a welcome addition.